Few countries today have the all-encompassing influence of the People’s Republic of China. China is now the world’s second-largest economy; the effects of policy and production in the “Middle Kingdom” ripple across the globe, affecting domestic outcomes in every nation. To know China is to know the future of global economics. 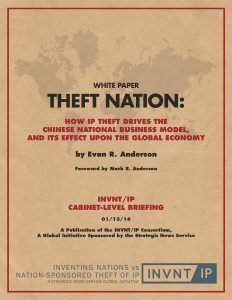 The Strategic News Service (SNS), INVNT/IP, and FiReBooks are proud to present the seminal work on China’s economy: Theft Nation: How IP Theft Drives the Chinese National Business Model, and Its Effect Upon the Global Economy. Through careful analysis of banking, currency, trade, and other economic policies in the PRC, Theft Nation exposes a massive system of fraud and intellectual property (IP) theft which threatens the stability of the current global system of trade and commerce. This work is a synthesis of data and reports from sources around the world, aggregated and analyzed to reveal the often-secret underlying strategies that fuel the Chinese economy. This is the only work that successfully explains the foundations of the PRC’s modern approach to growth, economics, and trade. After months of confidential circulation among the world’s top security personnel, cabinet members, and economic influencers, this report is now being made available to the public. In an era increasingly defined by economic fluctuations spreading worldwide from China, Theft Nation provides the information that decision-makers need to answer some of the greatest questions of our time: How does China make money? What is next for China and its trading partners? And, most important: What does this mean for you, your family, your business, and your country?